Will this cold weather never end? At the beginning of last week we had the first rain for ages. Although it poured down for the best part of 24 hours it barely elevated the level of the river. However. the water did colour up to such an extent that I decided that piking was likely to be a waste of time. Consequently, I bought a pint of maggots and opted to do a spot of float fishing. Now my approach to float fishing is fairly crude (to say the least) I use a light spinning rod and a small, old fixed spool reel loaded with six pound braid. On the end of the braid I tie a metre or so of two pound nylon and a size fourteen hook (what some of my pals would call a 'butchers hook'). A float a few shot and a couple of maggots on the hook and I'm away. As I say it was not getting any warmer (despite the rain) so I was not too optimistic on my first sortie. 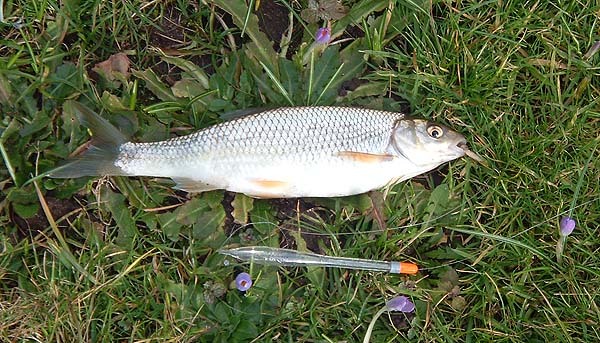 However, it was not long before I had my first bite and landed a small dace. 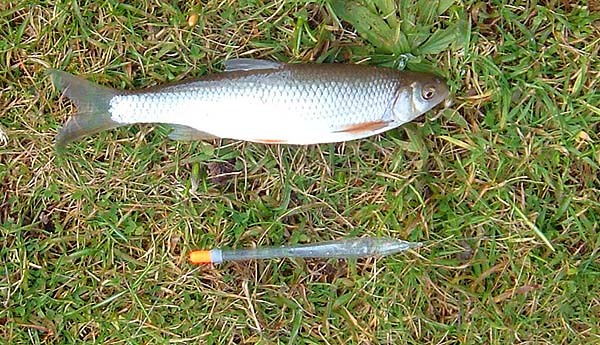 After that they came thick and fast, big ones, small ones and middling ones but all dace. As far as I could tell I had no bites from anything else. I never use a keep net so each fish was unhooked and returned to the same area that it was caught in - this did not seem to put the others off and I had an excellent couple of hours. Three days later I went fishing with my pal Nigel. This time the water had cleared and if anything it was even colder. The sun was shining but the sharp north east wind made sure that there was no rise in temperature so it was two jumpers a jacket, two pairs of trousers, a hat, chest waders and a waterproof (thankfully windproof) jacket. The fishing was transformed. 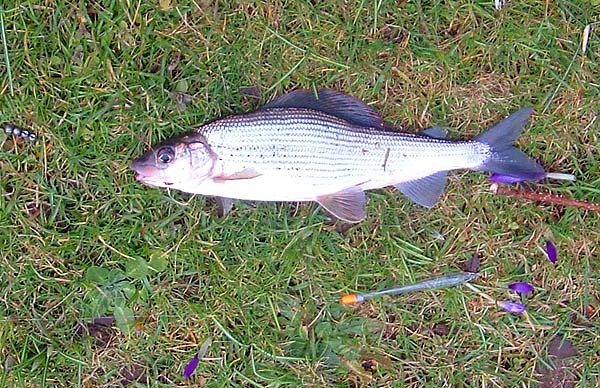 The first two fish (same spot that I caught the dace a few days earlier) a salmon parr and a gudgeon then it was one grayling after another. They pull pretty hard on the light gear wriggling and kicking in the flow so it is good fun to hook one. 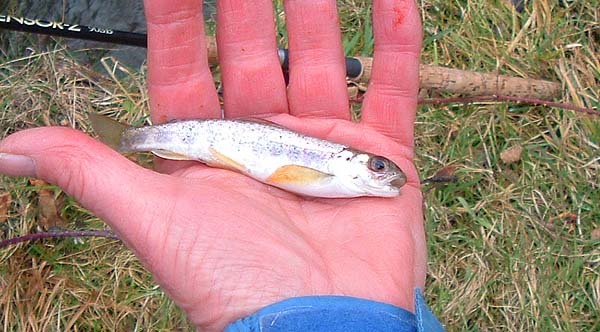 We caught one or two small dace but they were the exception. After a while we moved upstream a short distance to a pool with very little flow (almost none). 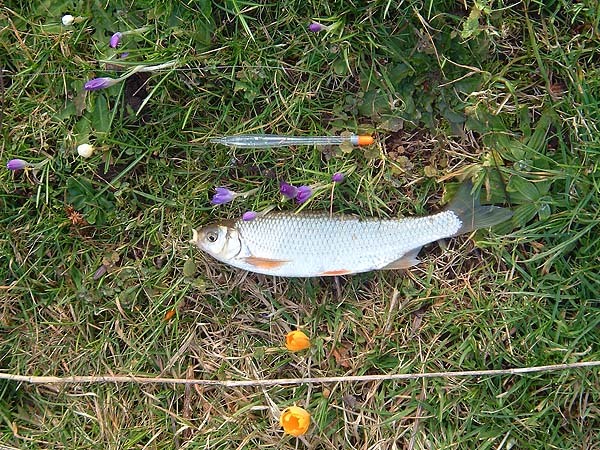 I cast out and laid down my rod while I threw in a few maggots. Nigel said "Your floats's gone!" 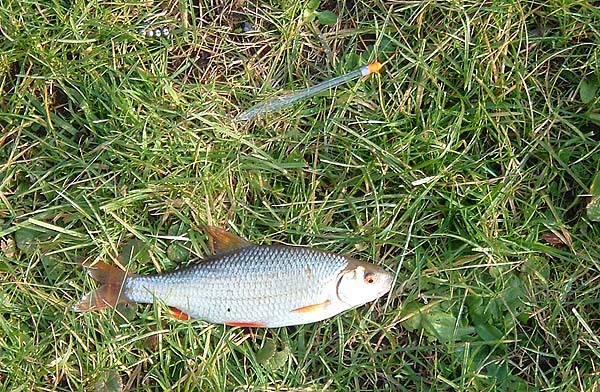 and I picked up the rod to find myself attached to a roach. 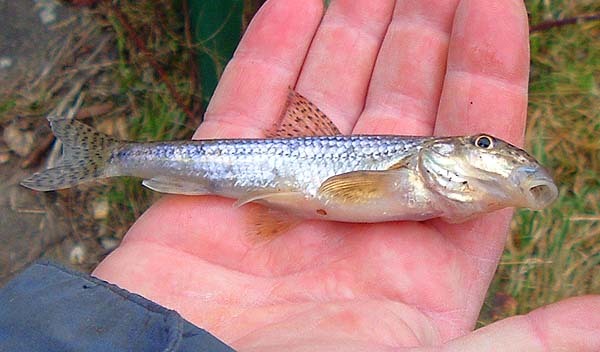 We had one or two tiny dace and Nige lost a decent grayling from the slow pool before we packed in. Totally different to my first trip but just as enjoyable.